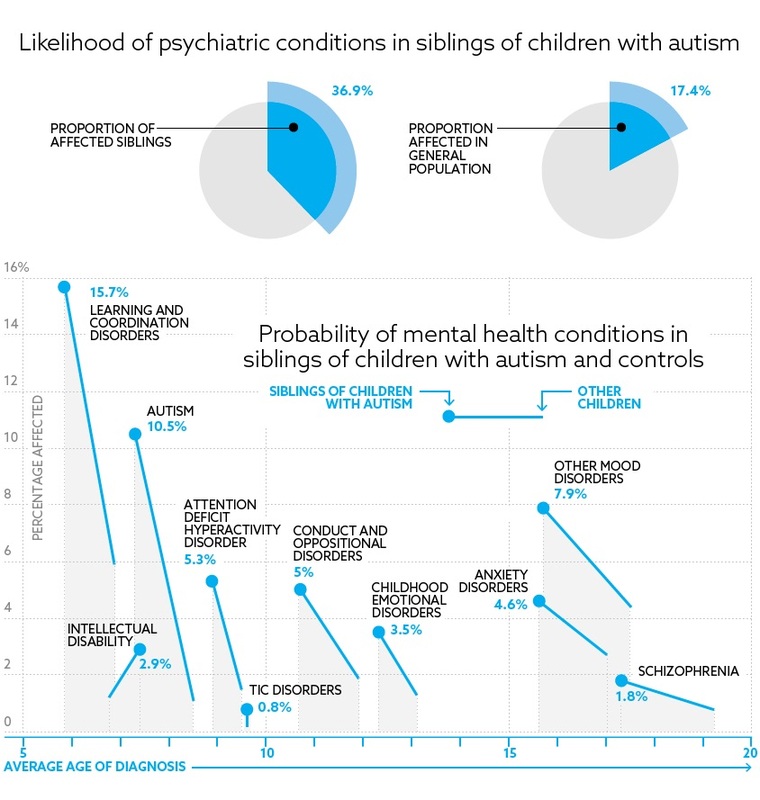 Psychiatric conditions crop up more than twice as often in families that include a child with autism as in the general population. That’s the upshot of the most sweeping study to date of mental health in siblings of children with autism. The findings suggest that clinicians should look carefully for signs of other problems in relatives of people with autism. Among siblings of people with autism, Brown’s team found high rates of seven childhood-onset conditions including autism, attention deficit hyperactivity disorder (ADHD) and learning disability. 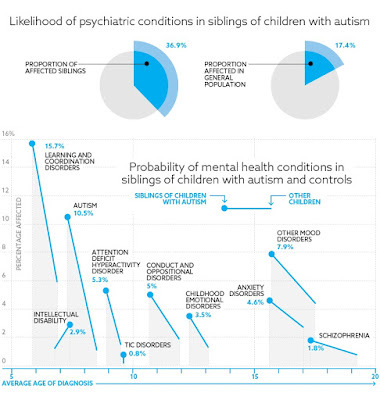 They also found that the siblings have higher rates of schizophrenia and mood disorders, among other mental health problems (see graphic below). How can we nurture and support this partnership? What barriers might parents face and how can we help them address those barriers? Why does it matter? What kinds of work goals might fit into the home environment? And how could these tie into the five Pre-Employment Transition Services categories? To learn answers to these questions and more, join us for this information-packed webinar! If your loved one with autism is prone to wandering, it is important to have a multi-faceted safety approach, no matter your setting. Here are some safety tools, products and forms to help you get started right away! For more safety and wandering prevention resources for families and first responders, visit autismspeaks.org/wandering-resources. If your child is participating in an Extended School Year (ESY) Program, this list of 7 Steps to Prevent Wandering at Your Child's School can help keep your child safe during the school day. MonTECH is part of The University of Montana Rural Institute: Center for Excellence in Disability Education, Research, and Service. MonTECH specializes in Assistive Technology and oversee a variety of assistive technology related grants and contracts. Our overall goal is to develop a comprehensive, statewide system of assistive technology related assistance. We strive to ensure that all people in Montana with disabilities have equitable access to assistive technology devices and services in order to enhance their independence, productivity, and quality of life. In pursuit of this goal, program staff work with consumers, service providers, educators, therapists, state agencies, private industry, researchers, legislators, and other interested individuals. Please take a few minutes to tell us about your experience with MonTECH. Your feedback is important to Montanans’ access to assistive technology. The survey takes less than 10 minutes. If you recommend MonTECH to students or families or work with MonTECH as a partner, please take the Service Provider and Partner Survey. If you have you used or could use MonTECH to receive an Assistive Technology demonstration, loan, or reutilization, please take our Consumer Survey. Two neurological conditions known for wreaking havoc in childhood may have some shared roots, suggests new research published Wednesday in the journal Neurology. Looking to settle an ongoing debate about the possible connection between epilepsy and autism spectrum disorder, the Swedish researchers extensively scoured the medical records of all patients admitted to a hospital within the country since 1987. From there, they identified just over 85,000 patients diagnosed with epilepsy. After cross-referencing with additional population data, they also tracked down some 80,000 siblings and 90,000 children of the epileptics, excluding any who had epilepsy themselves. Finally, they compared these families to the families of similarly matched individuals without epilepsy. Not only were patients with epilepsy more likely to later receive a diagnosis of autism than those without it, their siblings and children were also at greater risk. Parental engagement can sometimes be difficult and time consuming, but efforts on both the educator and parent sides can result in strong student growth and goal achievements. With the new school year upon us, it's critical to set a precedent in the new year. Join Angela Nelson, MS, BCBA as she discusses this important topic while giving real-world examples and tips from parents and schools nationwide. During this exciting new webinar, Angela will review and share tips, tools and strategies for teachers, parents, caregivers, administrators and paraprofessionals. Autism Spectrum Disorder (including high functioning autism, Asperger’s syndrome, non-verbal learning disorder) is the name to describe a set of symptoms on the autism spectrum. Many individuals with Asperger’s or autism spectrum disorder have strengths in fields such as math, music, the arts, and language. Many people with gifts in these fields have displayed characteristics of Asperger’s: Thomas Edison, Albert Einstein, Isaac Newton, and Amadeus Mozart are but a few. We have difficulties with novel social situations, non-verbal communication, small talk, making and keeping friends, rigidity of thinking and behavior, literal thinking, being perceived as rude and aloof, very narrow areas of interest, sensory issues (e.g., lights, sounds, and textures), etc. So if you think you might be on the spectrum and you are 18 or older, come join us for discussion and fun with like-minded people. We meet : Thursdays at 4:30 p.m. – 6:00 p.m.
Our meetings are currently open to people with Asperger’s Syndrome, family members and supportive friends. Some group members are available to do presentations to schools or other groups. Contact the above. The mutations that men accumulate in their sperm as they age don’t account for most of their increased risk of having a child with autism, reports a study published today in Nature Genetics1. Instead, the researchers suggest, men who carry risk factors for the condition simply tend to have children late in life. Several large epidemiological studies from the past decade suggest that the older a man is when he has a child, the more likely he is to have a child with autism or schizophrenia. For example, one study reported that men aged 50 years and older are twice as likely as men under age 30 to have a child with autism. At the same time, sequencing studies suggest that each year a man ages, he passes an estimated two more de novo, or spontaneous, mutations to children he sires. The findings suggest that de novo mutations in sperm account for, at most, 20 percent of the increased autism and schizophrenia risk associated with the father’s advanced age. “The small number of additional mutations in children with older fathers can’t really explain the increase in risk that we see,” Gratten says. Have questions about ASD and sleep issues you'd like to pose to an expert? Tune in and ask your questions in real time. Those behind a “brain training” program that claimed to improve autism and a slew of other serious conditions will pay up under a settlement with federal officials. The developers and marketers of LearningRx will pay $200,000 under a settlement with the Federal Trade Commission and have agreed to stop making several false and unsubstantiated claims about their programs. According to the FTC, LearningRx Franchise Corp. and its CEO Ken Gibson claimed that the programs offered at their more than 80 franchise locations across the country were clinically proven to improve a wide range of conditions including autism, attention deficit hyperactivity disorder, Alzheimer’s disease and stroke. The UW Autism Center will be holding two ABA Boot Camps this summer! We’ll be in Tacoma on July 19th-21st and Seattle on August 2nd-4th. Join us to learn about ABA strategies including prompting, reinforcement, shaping procedures, utilizing visual supports and collecting and analyzing data. Participants will have opportunities for hands-on practice and live coaching/feedback with children on days 2 and 3. It is imperative that we prepare students with disabilities for meaningful employment – this webinar provides actionable steps educators, families and students with disabilities can take to promote a successful post-school employment outcome. Stephanie will look at current employment statistics and initiatives, as well as, resources for supporting children and adults with disabilities through transition and into the workforce. She will discuss the importance of teaching pre-vocational and vocational skills, and will give ideas of the types of lessons to teach for more successful outcomes. Why employment is so important for individuals with a developmental disability, and the current state of employment opportunities in the United States Tips for assessments and steps in preparing for vocational training Ideas of skills to teach during pre-vocational and vocational training. Based on Dr. Marc Gold's "Try Another Way" approach to teaching people with intellectual disabilities, systematic instruction training [PDF] is a must for people supporting individuals who have difficulty learning - This three-day course provides: background on the history of supported and customized employment; strategies to organize job information and to teach individuals to be competent, confident employees in integrated, competitive employment; and a model to facilitate the development of natural supports in the workplace. Using her book, 7 Steps for Success: High School to College Transition Strategies for Students with Disabilities, Elizabeth C. Hamblet will share her experience and knowledge as an experienced special educator to assist teachers and others through the transition experience for students with disabilities. This workshop [PDF] is designed to assist educators, counselors, VR counselors, parents, and students in transitioning beyond high school. This training will focus on how to use Discovery as an age appropriate transition assessment and an alternative to traditional assessments. The training will be a day and half. Directly following the training will be a technical assistance session for those interested in creating a plan on how to implement discovery on a particular individual. Discovery is an optimistic, person centered planning approach that seeks to individualize work-based learning and employment outcomes for each student. Discovery provides a substitute to comparison based testing by utilizing already existing information from the student's life to gain insight into the student's strengths, skills, interests, and support needs. Discovery takes the student's entire life experience into account rather than forming assumptions based upon a single instance of performance. Discovery throughout students' transition years can be a work in progress that helps students form their career path development. Based on Dr. Marc Gold's "Try Another Way" approach to teaching people with intellectual disabilities, systematic instruction training is a must for people supporting individuals who have difficulty learning. This three-day course provides: background on the history of supported and customized employment; strategies to organize job information and to teach individuals to be competent, confident employees in integrated, competitive employment; and a model to facilitate the development of natural supports in the workplace. Find the above resources and more here. 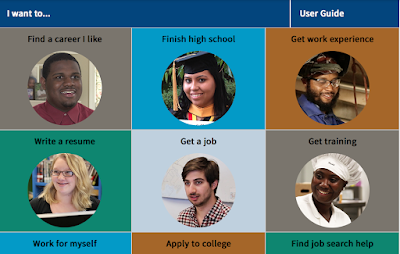 GetMyFuture.org is a mobile-friendly web application from the U.S. Department of Labor that helps youth plan their careers, explore education and training options, and search and apply for jobs. The app includes career interest assessments, interactive informational videos, job search engines, and tips and best practices. It also connects young people to in-person career services and resources to overcome the challenges of addiction; homelessness; criminal conviction; or a lack of financial, family or community support. Schools are exploring new ways to teach kids with high-functioning autism the rules of social interactions, especially since so many of those kids are now integrated in traditional school settings. Some schools, nonprofit organizations, private speech therapists, and parents provide direct instruction on social interaction using Michelle Garcia Winner’s Social Thinking curriculum or create a “lunch-bunch” social group in the cafeteria. Another strategy is teaching those skills through the arts. The emergence of Autism Spectrum Disorder (ASD) is at epidemic levels. But, as most would agree, ASD is an education, health and family issue that can be addressed successfully. Several entities at the University of Montana have combined resources with colleagues across Montana and the U.S. to develop a proactive, evidence-based approach to learning about and helping individuals, families and professionals thrive in this age of ASD. View the web page here. Donna Werling will examine the difference in prevalence of autism in males and females, and the potential mechanisms driving that difference. Children with autism tend to mix up personal pronouns, referring to others as ‘I’ and to themselves as ‘you.’ Some studies suggest this pronoun switching reflects a fuzzy distinction between self and others. Another possibility is that these children misuse pronouns because they have a poor grasp of language, so they resort to mimicking other people’s speech. Pronoun reversals cropped up in less than 10 percent of the speech of children with autism, who ranged in age from 2 to 5 years. These infrequent flubs are still more common in autism than in typical children of similar ages, who reverse pronouns about 1 percent of the time. Lead researcher Letita Naigles says she observes pronoun confusion in a specific group of children with autism: those who start using language before they grasp the intricacies of social interaction. We asked Naigles, professor of psychological sciences and director of the Child Language Lab at the University of Connecticut in Storrs, to explain the possible causes of pronoun confusion and its significance in children with autism. S: How do researchers explain pronoun reversal? LN: There are two explanations: a social one and a linguistic one. Many child psychiatrists do not see SPD as a distinct diagnostic label. They say the symptoms are too diverse and there’s too much uncertainty about what SPD is and how to distinguish it from other conditions such as autism, attention deficit hyperactivity disorder (ADHD) or anxiety. “We know that sensory issues are important in a variety of kids with a variety of different diagnostic labels,” says Carissa Cascio, assistant professor of psychiatry at Vanderbilt University in Nashville, Tennessee. Those who have sensory problems without any of the other conditions are rare, she says. But some parents say this doesn’t jibe with their experience, and that their children’s problems are fundamentally perceptual in nature. Brains from people with autism show patterns of gene expression similar to those from people with schizophrenia, according to a new analysis1. The findings, published 24 May in Translational Psychiatry, deepen the connections between the two conditions, says study leader Dan Arking, associate professor of genetic medicine at Johns Hopkins University in Baltimore, Maryland. People who have either autism or schizophrenia share features such as language problems and difficulty understanding other people’s thoughts and feelings. They also have genetic risk factors in common. “And now I think we can show that they share overlap in gene expression,” Arking says.